The Cartoon Network’s latest incarnation of DC Heroes will arrive on DVD this July! Young Justice features the sidekicks of the Justice League characters, training as a secret weapon to use against the criminal forces that plague our world. BURBANK, CA (May 4, 2011) – The newest Warner Bros. Animation–produced hit series on Cartoon Network finally arrives on DVD as Warner Home Video (WHV) unleashes its secret weapon with Young Justice Season 1 Volume 1. These DC Universe teenage super heroes have quickly proven to be a hit as the favorite show among boys 9-14. With non-stop action, Young Justice Season 1 Volume 1 comes to DVD for the first time on July 19, 2011. In Young Justice, being a teenager means proving yourself over and over — to peers, parents, teachers, mentors and, ultimately, to yourself. But what if you’re not just a normal teenager? What if you’re a teenage super hero? How much harder will it be to prove yourself in a world of super powers, super villains and super secrets? Are you ready to come of age in such a world? Are you ready for life or death rites of passage? Are you ready to join the ranks of the great heroes and prove you’re worthy of the Justice League? That’s exactly what the members of Young Justice — Robin, Aqualad, Kid Flash, Superboy, Miss Martian and Artemis — will find out: whether they have what it takes to be a proven hero. These teenage heroes collectively become the Justice League’s secret weapon against the forces of evil. The young protégés must put their super hero education to the test and band together to covertly fight the evildoers that exist on Earth-16. Utilizing The Cave as their home base, the teen heroes will take on under-the-radar missions that would be impossible for the league’s famous and identifiable elders to handle secretly. While the team works to take on more super hero responsibilities, they are in constant training by the Justice League to eventually take their place alongside the great heroes. Red Tornado is their supervisor; Black Canary is in charge of their training; and Batman determines and directs their assignments. Of course, in true teenage fashion, the members of the team push the limits of their missions, often turning a simple assignment from Batman into something significantly larger. 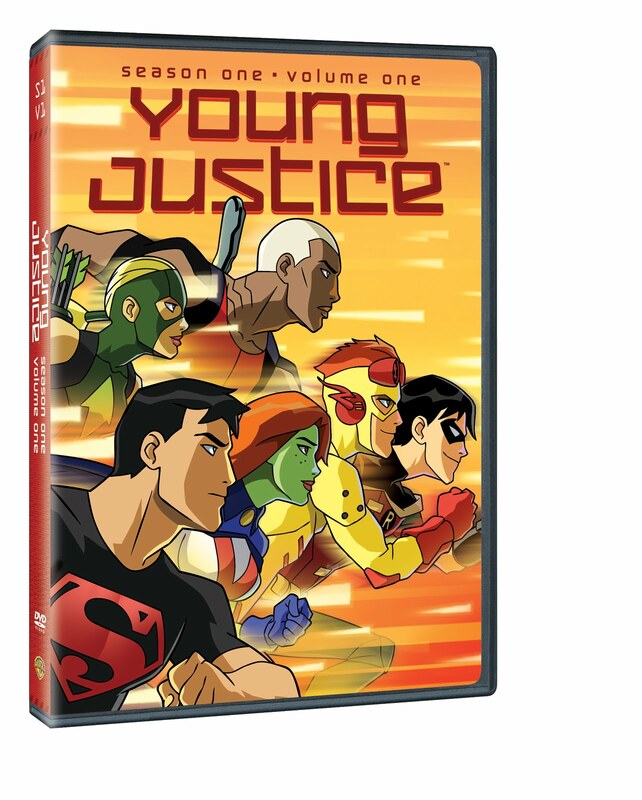 “DC fans have been vocal about their love for Young Justice, so I am particularly pleased to announce our first DVD release,” said Sam Register, Executive Vice President Creative Affairs, Warner Bros. Animation. Young Justice Season 1 Volume 1 is executive produced by Sam Register and produced by Brandon Vietti and Greg Weisman. The voice cast includes Jesse McCartney as Robin, Khary Payton as Aqualad, Jason Spisak as Kid Flash, Nolan North as Superboy, Danica McKellar as Miss Martian, Stephanie Lemelin as Artemis and Bruce Greenwood as Batman. With operations in 90 international territories, Warner Home Video, a division of Warner Bros. Home Entertainment Inc., commands the largest home entertainment distribution infrastructure in the global video marketplace. Warner Home Video’s film library is the largest of any studio, offering top quality new and vintage titles from the repertoires of Warner Bros. Pictures, Turner Entertainment, Castle Rock Entertainment, HBO Video and New Line Cinema. Warner Bros. Animation (WBA) is one of the leading producers of animation in the entertainment industry, with an innovative and talent-rich roster boasting some of the most accomplished writers, producers and artists working today. The studio is on the cutting edge of animation technology, and has both CG and traditionally animated projects in current production and development. In 2010, WBA unveiled three new theatrically released CG cartoon shorts that feature iconic Looney Tunes characters Wile E. Coyote and Road Runner, rendered in stereoscopic 3D. For television, WBA currently produces Batman: The Brave and the Bold, MAD, Scooby-Doo! Mystery Incorporated and Young Justice for Cartoon Network, and will soon launch The Looney Tunes Show, ThunderCats, Green Lantern: The Animated Series and more. WBA also creates the highly successful series of DC Universe Original Animated Movies for DVD. Producing for multiple platforms including TV, digital and home entertainment both domestically and internationally, WBA is highly respected for its creative and technical excellence, as well as for maintaining the Studio’s rich cartoon heritage. It is also the home of the iconic animated characters from the DC Comics, Hanna-Barbera, MGM and Looney Tunes libraries. One of the most-honored animation studios in history, WBA has been honored with six Academy Awards®, 35 Emmy® Awards, the George Foster Peabody Award, an Environmental Media Award, a Parents’ Choice Award, the HUMANITAS Prize, two Prism Awards and 20 Annie Awards (honoring excellence in animation). Win WHILE WE'RE YOUNG on DVD!